PROVO, UT- An unusual campus hero has got hearts fluttering. 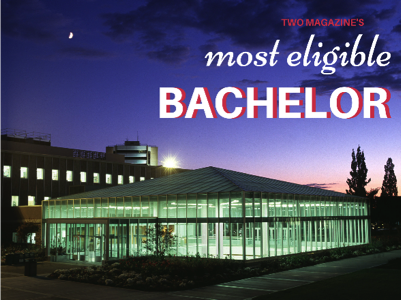 This year, TWO Magazine’s Most Eligible Bachelor award goes to a dark horse candidate: Harold, the BYU Library. Harold has also won hearts via his charming social media channels, checking into Twitter (@hbll) multiple times a day to engage in witty banter with students and other libraries. @hbll I love this so so much!! Love being friends with the library, it’s like everything I’ve ever wanted. Like all truly irresistible bachelors, Harold has his critics. “I kind of hold a grudge against him,” says Chemical Engineering senior Daniel Patton, hesitantly. “Last semester I was dating a girl, and it was going really well. All of a sudden Finals Week hit and I couldn’t get ahold of her. Turns out she was spending all these late nights with the library. I never really got over it, you know?” Several jilted boyfriends and husbands have confessed similar frustration, noting that for some inexplicable reason their significant others prefer spending time with Harold to watching sports highlights on ESPN. Whether you see him as a heartthrob or homewrecker, it can’t be denied that Harold the library is a powerful personality on BYU campus. TWO Magazine offers a warm congratulations to Harold, 2015’s Most Eligible Bachelor!